Among the various types of OD interventions are: Survey Feedback, Team Building, Sensitivity Training, Managerial Grid, Management by Objectives (MBO), Brain-storming, Process Consultation, Quality Circles, and Transactional Analysis. While this is not a complete list, it does highlight the need for at least three phases: diagnosis, solution development, action implementation. 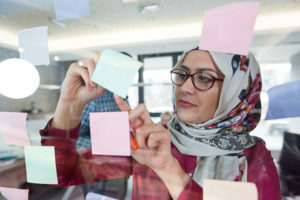 Today, concepts such as Organizational Agility capture the need for speed and effectiveness given that technology drives change with rapid and sometimes unpredictable results. Of particular interest to me is working in the space of Organizational Culture. This concept focuses on the deeply seated norms (accepted guidelines for interactions), values, and behaviors shared by people in the company or organization. 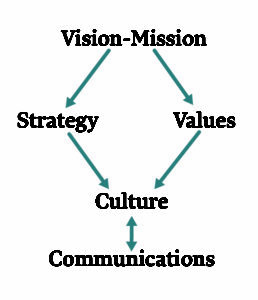 At AbiNader Advisory Services (AAS), we work with clients to consciously develop a direct link between commonly accepted communications behaviors that characterize how employees interact to the company’s vision/mission, strategy, values, and culture, as in this diagram. The key process outcome is to enable participants to speak to basic factors that cannot be observed – mission/vision, values, strategy, and culture – except through observable and measurable behaviors – in this case, their communications. 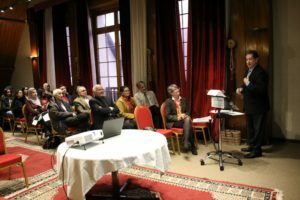 Importantly, in today’s context, it also provides a platform for discussing key agenda related to diversity and implicit bias. There are a variety of training modalities that can be used in the process, from scenario building and survey instruments to analyzing tactics to breakdown silos and accelerate information distribution. Concepts of work forces have changed as a result of advances in technology, shifts in the makeup of economies, and greater interest in direct customer contact. Labels such as “Gen X, Millennials, disruption, transformation, etc.” do not really add clarity to the continuous re-definitions that are occurring. What is clear is that a nimble/agile organization must be aware not only of how employees are evolving along with their roles/assignments, but how the shifting nature of their aspirations requires rethinking and redefining relationships from the board room to the operations floor.